I’m sore, tired and reeking with self-regard, having finished one of the most brutal hikes in the Bay Area today. 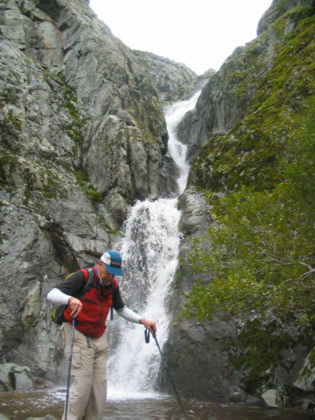 It’s six and a quarter miles into the heights of the Ohlone Wilderness to a weak excuse for a creek that flows over a rock formation at elevation 2900 to create Murietta Falls, the highest waterfall in the Bay Area. Most of the time there’s no water at the falls — the little stream that feeds it is no more than a couple feet wide, and it gets a good flow going only after several days of rain. It rained every day last week and another storm was on the way today — the forecast predicted an 80 percent chance of rain. 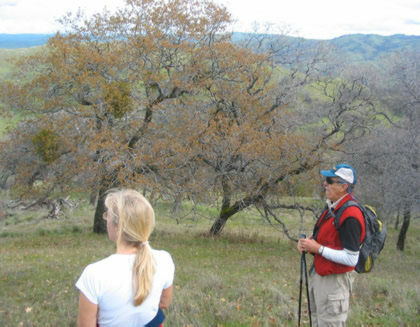 I was going to hike with Mike and Kathy but they called their hike off, so I set off on my own to Lake Del Valle in Livermore, which is about 40 road miles from where we live. It didn’t rain a drop in seven hours on the trail. 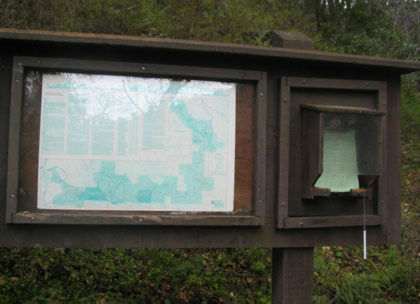 The eastern end of the Ohlone Wilderness Trail — which snakes 28 miles south and west, ending on the far side of Mission Peak — begins about a mile up the trail from this sign. You have to pay $2 for a permit and a map (available at the Lake Del Valle Park entrance), plus $6 to park. Well, it’s cheaper than a movie ticket. 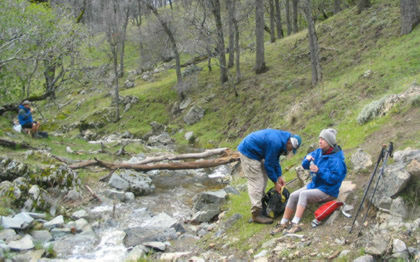 The out-and-back trek to Murietta Falls totals about 12.5 miles with over 4,000 feet of elevation gain. This is about the last flat patch of ground between here and the falls. 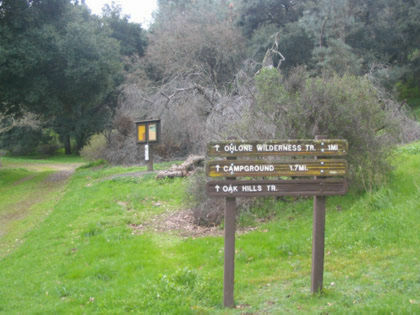 This is the official entrance to the Ohlone Wilderness. Hikers sign their names on the notepad, logging into and out of the Wilderness so the rangers will have an idea of who’s out there. I was the first one to sign today’s register, but there were about a dozen fresh names on the list when I returned. This is about two miles up the trail. I’m already nearly 2,000 feet up. 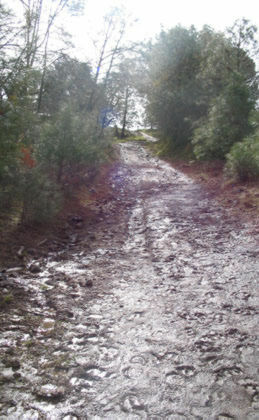 This is probably the muddiest patch of trail I encountered. Most of the trails were fine, except for being so damn steep. About two miles up, having just climbed over a thousand feet in less than a mile. And this was one of the comparatively easy climbs. See how that trail’s going down over the ridge? Well, it drops about 600 feet and ends up at a place called Williams Gulch. On the way down I started hearing this roar that couldn’t be the wind — it sounded too much like flowing water. Rainwater roars down the gulch. Not quite a waterfall, but scenic enough for my simple tastes. I crossed about here — at first I was thinking of turning back; it was almost 11 a.m. and I knew it’d be a couple hours back to the car. Then I got to the other side and lost all confidence that I could get back across the stream without landing in the water. But about that time two hikers came along who told me they were going to the falls. Unlike me, they had a rough idea of where they were going (I wasn’t exactly sure I was on the right trail here), so I made a snap decision to tag along with them. Just up from here stands a section of trail called The Big Burn — so titled because that’s what your legs start doing after the first 100 yards. The trail climbs from 1800 feet to over 3400 in about two miles, a relentless slog that would tempt anyone with a modicum of sanity to turn back. Here are Tony and Suzanne, who met me at the Gulch. We’re pausing to take in the scenery and I’m thinking "heck, this trail ain’t so bad." That feeling lasted for about the next 30 feet up the trail, where the ruinous uphill slog continued. 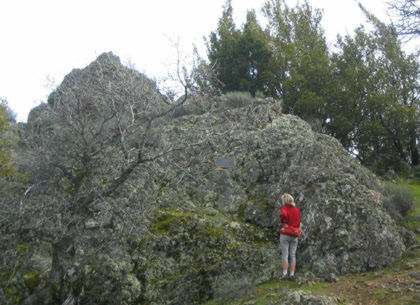 Suzanne checks out a plaque imbedded in the side of this rock, named for somebody named Schlieper. Tony assures me the trail flattens out about here, but it’s been four years since the last time he came this way. Somehow another 400 feet of hill grew since the last time he was here. Eventually, though, we did get to the top of the ridge and started working our way down to the falls. All along the way I’m thinking Christ, I have to come back UP all these hills. 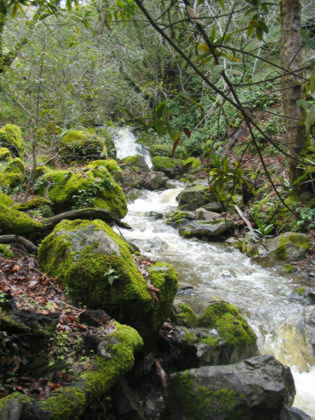 We see a little stream running through a rock formation and we know we’re almost there. Only one problem: we have to climb down this hillside that would motivate a mountain goat to upgrade his life insurance. Tony picks his way down this rocky path and as I follow him I can’t help wondering how in the hell I’m ever going to make it back up this patch of trail. Tony at the base of the falls. As waterfalls go this one is a bit underwhelming (and, mind you, it’s a raging torrent today — hikers consider themselves fortunate to find a trickle up here because the stream dries up so quickly). As we break for lunch, another hiker shows up over there at the left. I chatted with him for a couple minutes on the way back down… he said he’d been up here four times and this was the first time he’d seen water in the falls. I abandoned shame on the climb back up out of this little valley. I was going on all fours when necessary, grabbing rocks, trees, whatever, anything to save a little stress on my legs, which were going to have to propel me seven miles back to the car. Tony and Suzanne near the highest point on the trail. It’s mostly downhill from here, with one mildly steep patch on the way back up out of the gulch. Another Totally Cool Tree of California for my collection. 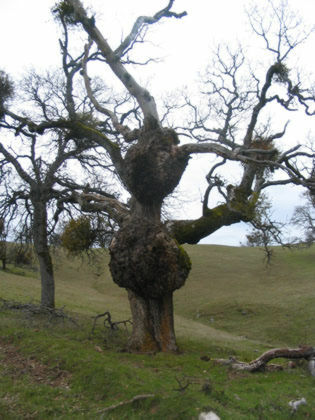 Somebody call a tree surgeon, this one’s got tumors the size of Toledo. Wildflowers bloom; spring can’t be far away. It’s almost 2:30 and there’s a lot of trail ahead of me … I wasn’t sure how long it’d take to get back to the car but I wanted it to be before sunset, when the Del Valle park closes. Tony and Suzanne slowed down a bit to save the strain on their feet and knees but I was feeling fine as long as the trail was going down. I took off without even saying goodbye, which caused nagging guilt all the way back. If I see one or the other of you two again, I owe you a beer. Making it all the way without so much as a cramp; no mishaps or even mild scares. Fulfilling my goal of making one of the area’s toughest hikes this spring. Seeing unusually high water flow at the falls. On the way back from the falls we passed a couple hikers who had just finished the grueling Big Burn. One asked, "are they worth it?" We all said "you betcha" but I knew it was a bit of a fib — the falls are not especially impressive. But the trip getting there, it’s Mastercard material. You know, priceless. I’m certainly glad I wasn’t on this hike with you. You are my inspiration, though. I keep trying for harder hikes all the time in hopes of doing a fraction of what you are doing. And, what we were planning on hiking that day was so very much less that what you did. I love your writing — “tumors the size of Toledo”. 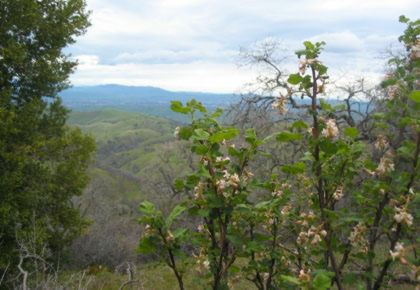 The next time FOMFOK goes to Sunol, there should be something between a minor uprising and a riot of wildflowers. 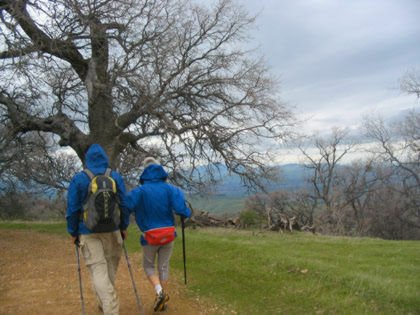 Mike: I had every intention of a nice, relaxing hike at Sunol Wilderness w/you guys … about a half-hour before I checked in with Kathy on Sunday morning I looked across the valley and saw rain clouds over Sunnyvale so it wasn’t a surprise when I got the no-go message. It was cloudy and blustery up here but not raining yet, so I decided to take another visit to the park at Lake Del Valle, with the plan to hike a few of the park’s trails and head back at the first sign of rain. 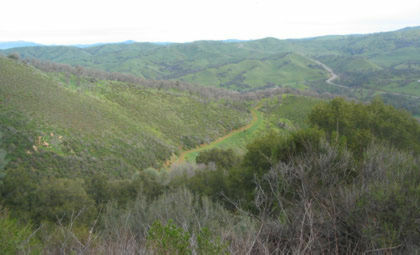 Of course when I got to the park entrance I succumbed to my urge to buy an Ohlone Wilderness permit/map, and with that in hand I was sorta obliged to check out the trail up towards the falls. It was really something of a fluke that I went all the way to the falls, though. 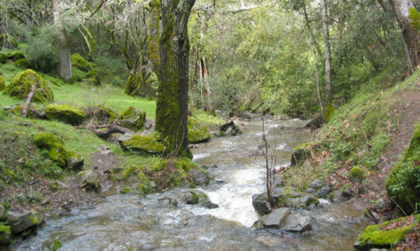 When I was at that creek crossing it occurred to me that even if I did hike on, the creek might become dangerously engorged w/water if a storm broke out, and that much harder to cross on the way back. But those hikers I met said they were going so I made a snap decision. It was a LOT harder than I expected, and I was just about tapped out when we got to the falls. But I ate my lunch and it seemed to have enough juice to get me out of there. 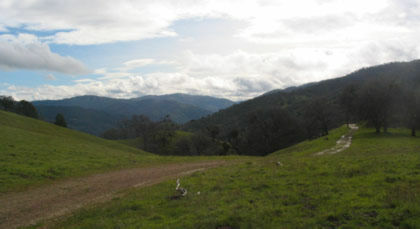 I think we were all pushing our luck on that trail with so much rain in the forecast, but our luck held, fortunately. Wow, I’m jealous. Must be nice to be able to do that this time of year. No such fun here. Man, don’t you love that! I remember my first “hike” of the season last year to the Sheffauer (one of the Kaisergebirge near Kufstein, Austria). After several hours of what seemed like walking straight up, my brother-in-law laughed when I asked if this was the hard part. He said, “this just gets us to where it gets really steep.” He wasn’t kidding. To add insult to injury, the way they rate the trails, this was the easy route.